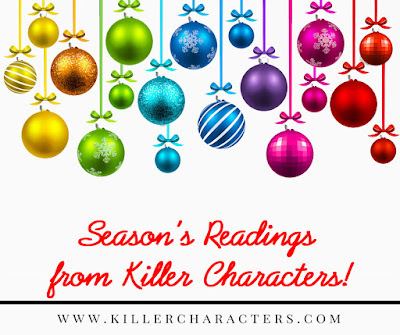 Killer Characters: Decorating for Christmas - and Murder? Decorating for Christmas - and Murder? Season's Readings! 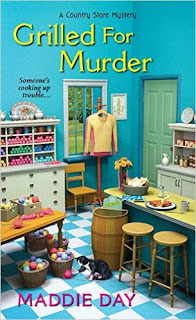 Robbie Jordan here from the Country Store Mysteries, written by Maddie Day - who's offering two holiday giveaways. There's Birdy on a pile of our books. He loves being on the covers, and in the stories, too. My author, Maddie Day (otherwise known as Edith Maxwell), wants to offer you an early Christmas present, or a gift for whatever holiday you celebrate. 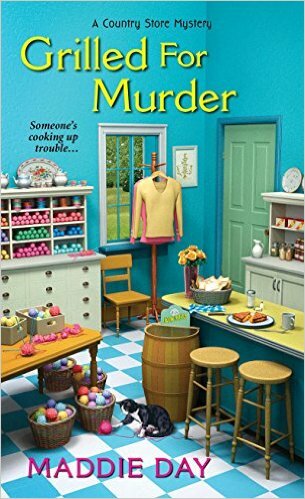 She'll send along a signed copy of Flipped for Murder to one commenter, and a special Edith Maxwell author mug to another. All you have to do is leave a comment about your favorite holiday custom or decoration at the end of this post. She'll pick a winner on Saturday, December 5, and will post the name here. Make sure you leave her some way to contact you in your comment. 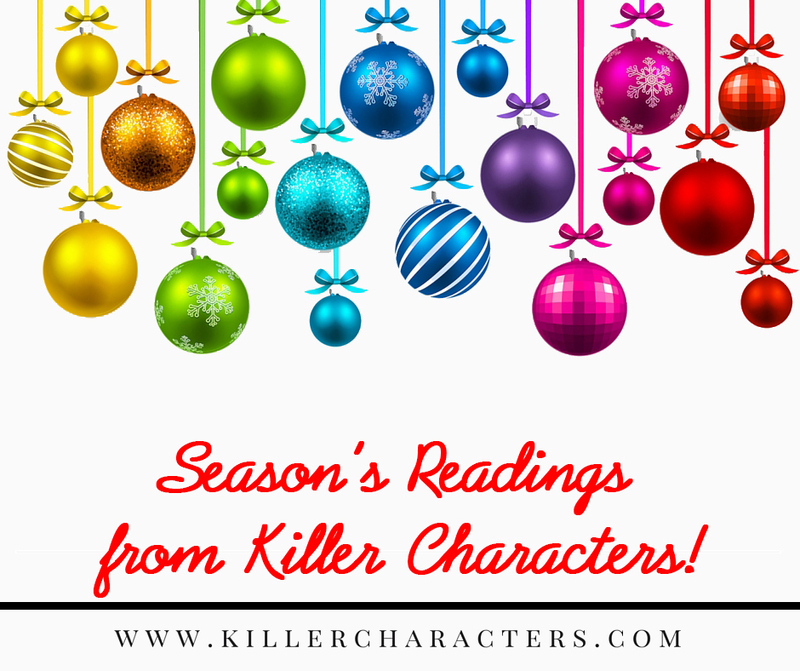 And remember, every day this month through Christmas there's a giveaway from one of the Killer Characters for Season's Readings! I hated feeling helpless, but I’d done all I could, so I might as well decorate. Having busy hands sometimes let puzzle-solving thoughts into my brain, too. And if ever there was a puzzle that needed to be solved, it was the question of who really killed Erica Berry Shermer. Because I knew as sure as I was a Californian that Phil didn’t. I called and left him a message on his cell, asked him to call me back. I almost said more, but disconnected. We’d talk later. Wincing at the sight of the plywood, I dragged over the stepladder and looped the first string of lights over the front door. I’d asked at the store if I could order new glass today, but they’d said Don, the owner, had to do the ordering and he didn’t come in on Sundays. I plugged another string into the first one and stretched it between the windows and on top of the window frames, adding more strings as I went, until I reached the end of the front wall. I knew Phil hadn’t killed Erica—didn’t I? I was as sure as I could be. He was a gentle, generous, fun-loving soul. So who was the real murderer? Erica and Tiffany had argued, but it wouldn’t make sense for Tiffany to kill someone she’d accused of stealing, not if she wanted to get her jewelry back. I started stringing lights on the other side of the door until I got to the cookware area. That part would have to wait to be decorated until the evidence people were done with it. Max had seemed angry with Erica for taking Paula’s side. Surely not mad enough to kill her, though. Maybe the murderer was somebody in Erica’s past. Or someone who’d followed her here from Chicago. I’d ask Jim tonight if he knew anyone in Erica and Jon’s group of friends or business associates. I couldn’t remember what Jim had said his brother did for work, if he even had. Jim had spoken only once to me about his brother’s suicide. He’d said losing his twin was like losing a chunk of himself, and that he’d had no idea Jon was that despondent. Or why he would be. I inserted the last plug for the lights into a wireless device and plugged the device into the wall. I stepped back and flipped on the switch. The sight of all the little white lights did, in fact, cheer me. I turned to the kitchen area and hung green garlands under the counter and over the door to the walk-in, adding a red bow here and there to brighten them. All I needed was a model train set running around an oval in the front window, with tiny snow covered houses and a miniature Pans ’N Pancakes in the center of town. I wasn’t particularly religious, but I loved the Christmas season, especially here in the Midwest where the days were short and the temperatures chilly. Christmas in Santa Barbara, where I’d grown up, was a different experience altogether. Mom and I had usually taken a Christmas brunch picnic to the beach and soaked up some cool sunshine while we celebrated. Once, when I was eight, we’d come to Indiana to spend Christmas with Adele. It had snowed on Christmas Eve, and I couldn’t believe I was seeing the winter wonderland I'd only read about in books. At home the winter air smelled of orange blossoms and sea breezes. Out here? The crisp taste of apples and the sharp smell of snow were more the order of the day. I do love decorating the Christmas tree with all of the family. It's a very special tradition. Your picture of Birdy laying in the pile of books is just too cute! We just adopted our 3rd cat from the Humane Society a month ago. Jingles,11, is still getting used to things, but is a little sweetie. Christmas really is the most wonderful time of year and it's so hard to pick favorites. My nativity was a gift from my grandma is very special to me, but I also have many ornaments from when I was a little girl that are dear to me as well. I love my Christmas Tree but I also like to put up all my cards. I put up the tree and hook up the "darn Christmas lights". Then my daughter and grandson come over and decorate the tree. Everyone has there favorite ornaments. Almost 50 years worth. Merry Christmas. Being with all my family is my favourite tradition. I love getting out all my Christmas decorations and the memories that go with so many of them. The Christmas season begins when I get out the Christmas dishes and mugs. I love all the lights and decorations and use the Christmas dishes all through December. But the best thing is decorating the tree with ornaments we've collected over the years and putting on tinsel. It's old fashioned but reminds me of my Christmases growing up. Thanks for the great giveaway. We celebrate Christmas on Christmas Eve. As children we went to visit our grandmothers on Christmas Day. On Christmas Eve my dad had to run to the store for cigarettes. The one time of year we accompanied him. When we returned, Mother was waiting outside saying we just missed Santa! If we looked up fast we could probably see him!!! Never saw him, but obviously he had been there when we went inside. I love decorating with lots of lights and sparkling ornaments. My favorite holiday custom is baking cookies on Christmas Eve! If I do win I would please like the mug because #1 it is awesome! And #2 I already have the book. Thank you very much for the chance and happy holidays! Baking Christmas cookies and decorating the tree. The best part of the holidays is some quiet time with family. Putting up the Christmas tree was a fun family affair. Baking goodies and drinking cocoa! What a great array of memories and favorites! Keep 'em coming. And thanks for entering. Very cleaver title. I've given my youngest family 4 generations of Christmas ornaments for the first Christmas in their own home. I'll settle for a wreath and keep my Hallmark Houses and Shops to put out with a mini tree and Hallmark mini ornaments.New tradition for me with mix emotions but they moved from my house to next door. They were so lucky to buy a house that has many memories from from people who were like grandparents to all my sons. Love the cover of your book! Our traditions include putting the tree up in December and opening presents on Christmas Eve! Happy holidays to you and your family from California!! My favorite decoration is a plush bear ornament I got when I was a kid. I have a cat angel for the top of my tree. I eagerly waiting for my daughter to get home tonight to decorate. Can't wait! My favorite holiday custom is watching our favorite christmas movies/shows as a family. Even though my kids don't live at home anymore, they still like to come by and watch a show with us. We all have them memorized and have our favorite parts. But watching A Christmas Story or White Christmas together is such a special treat. My favorite Holiday custom was finding our own Christmas tree. But the problem was we live on the prairie of South Dakota. Not too many Christmas trees to be found. But my parents came up with a solution. They bought a tree in town and Dad hid it on our farm. Somewhere on our acreage. Then on a Saturday before Christmas we were told to go find it. It was great. Sometimes we found it quickly, sometimes we trudged through quite a bit of snow before we found it. But we came home with our perfect tree! My holiday favorite decoration is the Christmas tree. I enjoyed the first book in this series. Can't wait for the next installment. My favorite Christmas decoration is a ceramic teddy bear trio dressed in Christmas attire. It was a surprise gift from a dear friend. In addition to putting up the tree and decorating it, I also like to have the plum pudding on Christmas day with trinkets hidden inside of it and after having poured brandy on the pudding and lighting it, we all get a little piece of the pudding and hope to get the lucky trinket. Thanks for the wonderful giveaway. My favorite decoration was the bubble lights that we used when we were children in the 50's. My favorite decorations are from when I was little! A stuffed Rudolph and Clarice that now adorn my piano at the holidays! Thanks! Birdy- that is how my cats "respect" my TBR piles too. How did I not know Edith had this pen name? That is exciting to me and a whole new collection to begin! My holidays are much quieter now that I am alone, but my collection of Rudys and Rhondas keeps me company. And I pick up Yukin Cornelius figures when I can find them. I enjoy going to my niece's Christmas tree decorating party. Our is to read 'Twas A Night Before Christmas on Christmas Eve. We wooden characters to use with reading the story. Happy Holidays, and thank you! I like to watch Christmas movies on TV and on Christmas Eve I'll eat my turkey dinner (Stouffers). My favorite Christmas tradition is the family working a Christmas/Winter jig-saw puzzle starting on Christmas Eve and finishing on Christmas Day. I provide the puzzle each year (my dad started this one back in the '80's) and we all have fun. Have the first book which I loved but would like to win the mug.